Fujiwara no Yoshitaka held the rank of 'shōshō', (‘minor captain’), at the 10th-century Heian court. As a 12 year old, he garnered attention at poetry parties at the palace for his skills in composing linked verses. 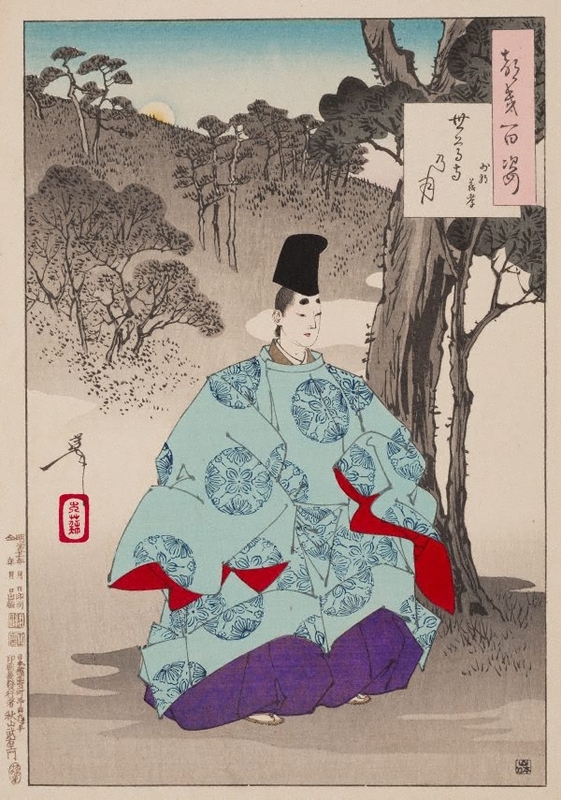 To avoid conflict with his older brother, Agechika, who was likewise an accomplished poet, Yoshitaka eventually gave up poetry to concentrate on Buddhist studies. Dressed in courtly attire, he is shown here sitting deep in thought in an extensive garden ground on a moonlit night. Even though no characteristic landmarks are in sight, the print’s title identifies the location as the ground of Seson temple outside of Kyoto.